A few days ago we put some of my thesis work on the impacts of tropical forest logging on the preprint server PeerJ. The work is currently in review elsewhere but I thought I should put up a blog post about our findings, even if they change a bit after the review. I am really pro the idea of making results available as soon as possible so that they can be read and cited. I have lost count of the number of times a piece of work I have seen presented at a conference and wanted to cite has taken 1-2 years to come out as a paper. In short I think preprints are the future, so feel free to read, comment on and critique ours over at Peerj (and you can even cite it if you like). A fifth of tropical forests have been logged in the recent past. Though logging is an important source of timber and jobs it also faces questions about its long-term sustainability particularly in its impacts on biodiversity and carbon. However, as I have written before, the results of studies on the impact of logging are very variable making generalisation difficult. Previous meta-analyses of the impacts of logging have indicated that biomass losses can be as high as 66% or as low as 4%, while tree species richness may be reduced by as much as 53% or show increases of up to 27%. However, none of these meta-analyses of the impacts of logging on tree biodiversity or biomass have explored the potential reasons for these differences. 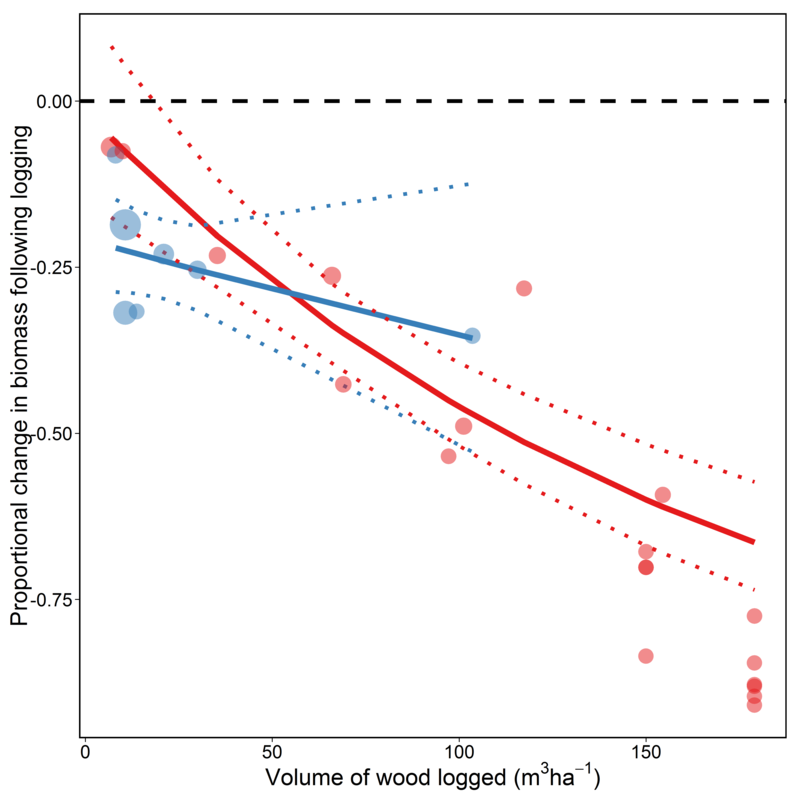 A recent study showed that differences in the impact of logging on animal species richness was explained by the variation in intensity of logging at sites, measured as the volume of wood removed per hectare. Interestingly this study showed that while species richness generally declined for amphibians, mammals and invertebrates with increasing intensity, bird species richness actually increased slightly. Another recent piece of work by Jake Bicknell and colleagues has shown that a method called reduced impact logging (RIL), a technique which aims to reduce logging damage by altering extraction methods, reduces the negative effects of conventional logging techniques on animal population sizes. This is an important result as RIL has long been championed as a potential solution to the problems of logging sustainability and Jake’s work is the first to really show that it has positive effects across a number of sites. So while two recent meta-analyses have indicated that logging intensity and method may have a profound influence on forest biodiversity no similar work has been done for trees, despite the fact that programmes that focus on conservation of carbon, such as REDD+, need this evidence to implement policy. So to fill this knowledge gap we performed a meta-analysis to determine what factors relating to logging intensity and method may cause variation in the impacts of logging on residual tree damage, aboveground biomass and tree species richness. In total we collected data from 62 studies across the tropics giving us 38, 43 and 9 data points for investigation of damage, biomass change and species richness change respectively. Promisingly we found that RIL seemed to reduce residual tree damage compared to conventional logging, with greatest differences to conventional logging found at low intensities. However, at higher intensities residual damage became more similar to that of conventional logging as suggested by previous work from Indonesia. However, the same wasn’t true of biomass. 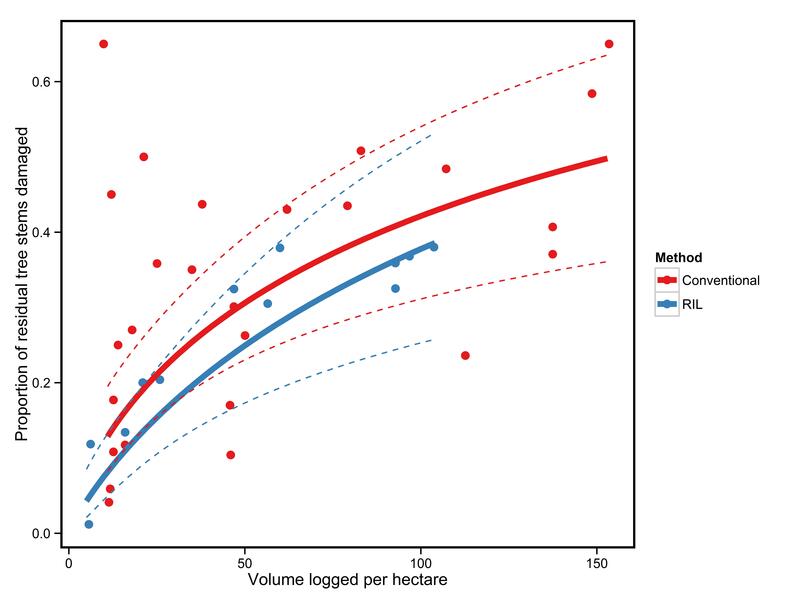 Though there was an apparent statistical difference in the slopes for RIL and conventionally logged forests the relatively low overlap in the intensities at which conventional and RIL are carried out means that slope estimation is not fantastic. As such it is not entirely clear whether, at the stand scale, RIL reduces biomass losses because of lower intensities or differences in practice as the two are confounded. Unfortunately there wasn’t enough information on species richness from forests logged using RIL to allow a comparison. However, the results were still interesting. 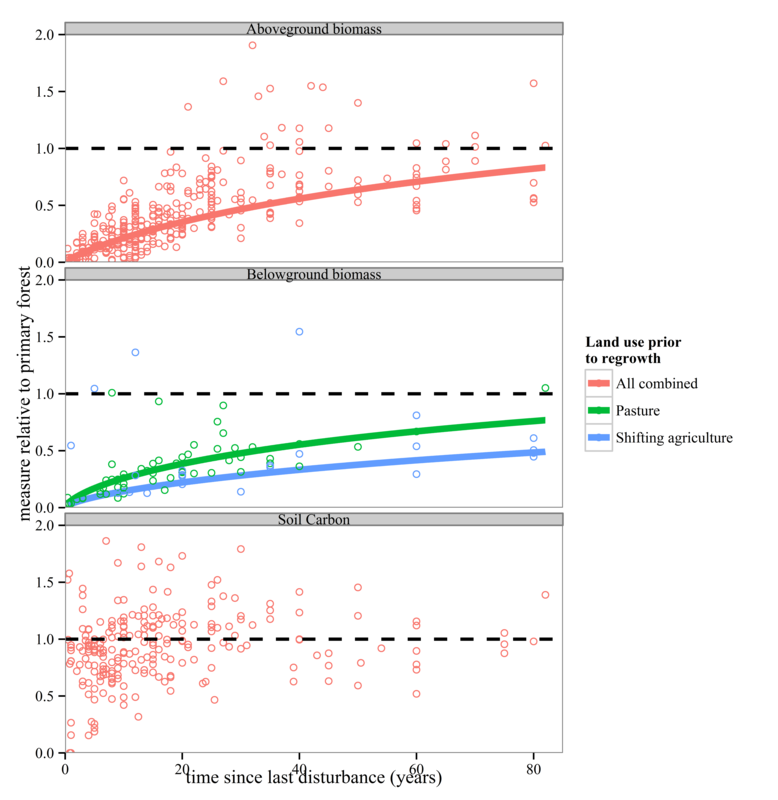 There was a general decline in species richness with increasing logging intensity, but the plot hints that richness might increase at low intensities. Whether or not this is as a result of intermediate disturbance hypothesis type relationships is not a fight I want to get into, but this work does confirm that tree species richness is relatively insensitive to logging even at high intensities. So our work suggests that the evidence for the positive effects of RIL is mixed, once we account for differences in logging intensity. I am well aware that this piece of work might annoy a few people who think I have something against RIL. Those I have spoken to at conferences where I have presented often think that I am saying that RIL doesn’t work. I’m not. It just isn’t entirely clear what it’s effects are. Frankly it would be remarkable if RIL and conventional logging had similar impacts at the stand scale given the differences in the two practices. What I think we lack is enough evidence to say what is going on. So what would be a constructive way to determine the differences in impact of RIL and conventional logging? One thing we think would improve evidence is the quantification of logging intensity at the plot scale. Currently studies often report logging intensities for the entire landscape where plots are located, meaning that the variation between plots is not accounted for. There is likely to be a big difference amongst plots and so the impacts are likely to differ as well. As far as I can tell only a few studies have done this. One good example is the work of Lucas Mazzei and colleagues who showed that plots that had been more intensively logged showed a slower recovery in biomass. Metrics such as the basal area of trees removed per hectare might be useful and relatively easy to collect at the plot scale. The results of our study and those of Zuzana Burivalova suggest that logging intensity drives carbon and species loss while Jake Becknell’s work suggest that RIL is less damaging for animal populations. 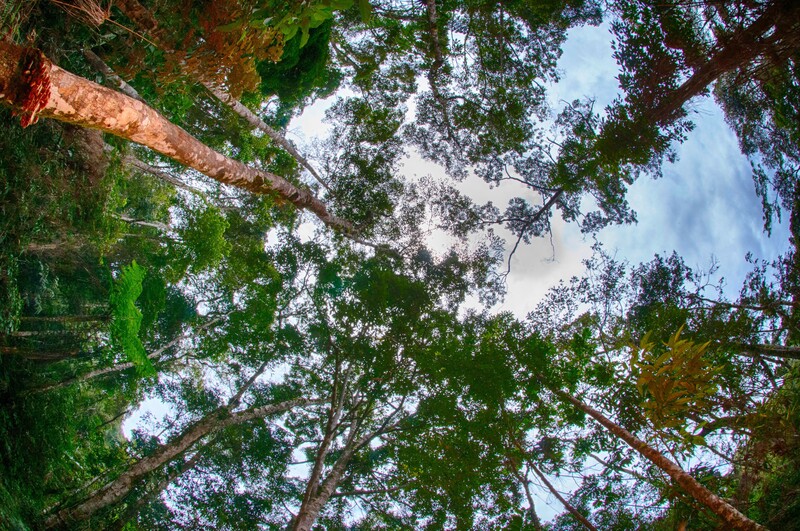 As such, current evidence suggests that RIL at relatively low intensities is likely to be the best way to reduce carbon and biodiversity loss in tropical logged forests. However, given the massive area of tropical forest already designated for logging reductions in local intensity, and thus yield, may encourage expansion into previously unlogged areas. Recent work indicates that high intensity logging over a smaller area (‘land sparing’) may have better outcomes for tropical forest species than low-intensity extensive timber extraction (‘land sharing’) in Borneo, though there is a need for similar studies in other areas of the tropics. Although reductions in logging intensity may reduce impact, the high demand for timber requires novel solutions that do not drastically reduce current yields but reduce impacts on forest ecosystems. Methods such as silvicultural thinning techniques to remove pioneer species may aid recovery of floral community composition, carbon and timber stocks but further work is needed to assess their effectiveness. Although RIL may also provide a solution, further evidence is required to verify this for carbon storage in the form of above-ground biomass. Analyses that take into account plot level variation in logging intensities using collaborative networks such as The Tropical managed Forests Observatory offer a potential solution to this. 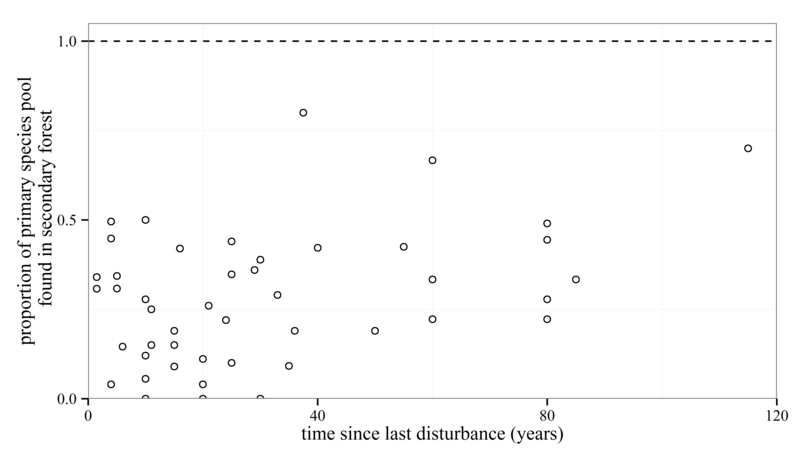 How long does tropical forest take to recover from agricultural clearance? 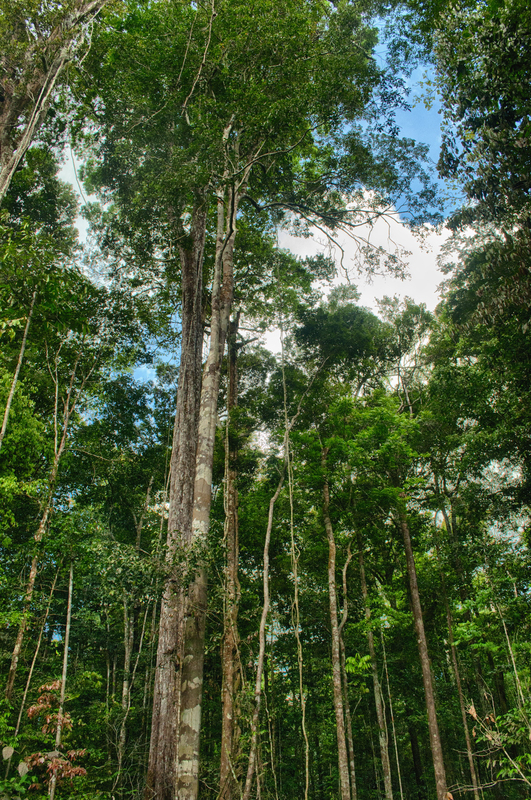 Today our work on the recovery of secondary tropical forests got published in Royal Society Proceedings B. I’m really chuffed with this piece of work and in this blog I’m going to summarise what we found out and why I think it’s important. If you want to read the paper you can get it here. Large areas of tropical forest have been cleared for agriculture over the last 100 years. Why does this matter? Well it matters because these forests are vital for the unique biodiversity in the tropics but also because humans can benefit from them remaining intact. Their loss causes extinction, release of carbon into the atmosphere – worsening climate change, and changes the ecosystem services we get from these forests. Because of the importance of these forests their restoration is seen as a priority by some. There are valiant attempts to restore tropical forests in Brazil and various Central American countries. In addition there are also international initiatives that aim to encourage the restoration of carbon and biodiversity (E.g. CBD & REDD+). These are great and ambitious aims but, until now, we didn’t really know how long these recoveries took, or whether recovery was different for different disturbance and forest types. To solve all this we collected the biggest dataset yet compiled on recovery of aboveground, belowground and soil carbon as well as plant species richness and community composition following agricultural clearance. All this data came from previous studies. We found that after about 80 years aboveground carbon storage was around 85% of that found in undisturbed forests, while belowground carbon storage seemed to recover more slowly. Soil carbon showed no relationship with time since clearance. 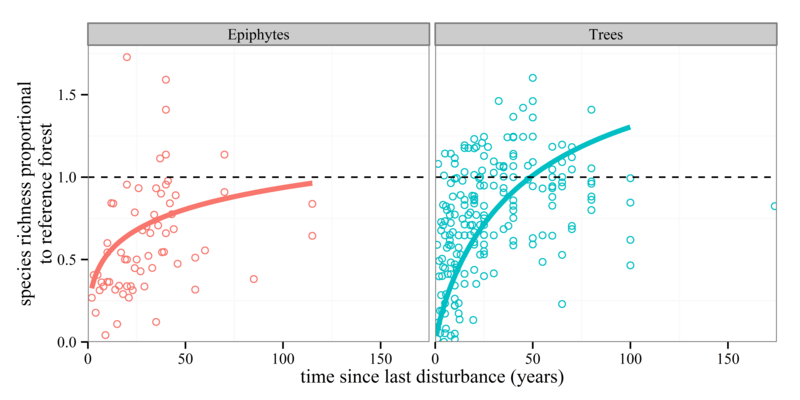 In terms of biodiversity both tree and epiphyte species richness seemed to increase over time, with tree richness recovering after around 50 years since disturbance but epiphytes took around 100 years. However, when we looked at species that are found in the undisturbed forests, relatively few of them are found in the recovering forests. They didn’t seem to accumulate over time either. Given that these species are likely to be more prone to extinction it is worrying that they don’t seem to be doing very well in secondary forests. We think that carbon recovers relatively well following abandonment of land since there tends to be a rapid influx of woody species. However, we also think that complete recovery of carbon is likely to take more than a century since this is likely to be dependent upon large, slow-growing trees. Differences between tree species richness recovery and that of epiphytes is likely to be because tree seeds are more easily transported between forests than those of epiphytes. Also epiphytes seem to be found more on big trees, and there don’t tend to be many of these in secondary forests. The lack of recovery of species found in undisturbed forests is perhaps the most disturbing thing that we found. We think that to improve this situation there may be a need for management of these forests by planting trees and helping to increase dispersal of seeds throughout the non-forest areas. There’s been lots of great work recently on the value of disturbed forests. We hope our work goes into a bit more detail where the soon-to-be-classic work of Luke Gibson etl al left off which showed that primary forest has greater conservation value than any types of disturbed forest in the tropics. We agree with this, particularly for specialist species. However, most tropical forests are not primary forests and have been logged, cut down or burnt at some point in recent history. Because of this we think that older secondary forests need to be recognised as important for conservation and carbon storage and their clearance should be avoided. These forests are not worthless.